Carb Stopper Extreme is a nonprescription diet pill that claims that it will be able to help a dieter to boost weight loss by increasing the metabolism and the rate by which the body burns fat. However, at the same time, it claims that it will be able to accomplish this goal through a single active ingredient. That substance is white kidney bean extract. While there are some studies that would suggest that white kidney bean extract could help to reduce the amount of carbohydrates that are consumed in food, but this is not what the official website of the product claims that it will do for weight loss. Instead, it talks about reduced appetite, increased energy levels, and better fitness. None of those claims have ever been linked with white kidney bean extract in any reputable scientific studies. Another curious point is that the official website’s description of the product talks about ingredients, plural. However, when the ingredients section of the website is accessed, it speaks exclusively of white kidney bean and extract does not make any mention of any other substance within the product. Either this is a very important error that has been consistently repeated throughout the website, or that site does not provide the user with a complete list of the different substances that make up the formula, which is a rather dubious practice. At the time of this review, the list price for Carb Stopper Extreme was $49.95, though it was available for a sale price of $19.95 at the time that this piece was written. That said, the sale price is still notably higher than other supplements that contain the one ingredient of white kidney bean extract because each bottle contains only 60 capsules. The directions for use say that 2 pills should be taken before every meal with a full glass of water. Assuming that the dieter eats 3 meals per day, this would require six capsules per day. That means that one bottle would last only 10 days. At that rate, the product would cost $59.85 per month, which is an astronomical price. In fact, this is still high when taking into consideration that the site is offering a deal in which two free bottles are shipped when three others are purchased at the same time. 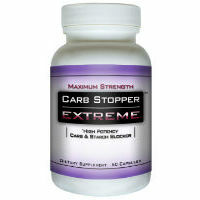 Considering the cost of the product, the lack of complete ingredients list (or typos suggesting that there is more than one ingredient, when there isn’t), and the fact that the benefits listed are not linked to the use of that one ingredient, it would be very difficult to recommend Carb Stopper Extreme. This entry was posted in Non-Prescription Diet Pills Reviews and tagged carb blocker, white kidney bean extract on May 9, 2014 by Diet-Pills.cc.